It’s been quite a winter here so far. Temperatures have been bouncing around all over the place, -2°c one day +11°C the next. It’s also been blowing a hooley one day and calm as can be the next. So what has that meant for cycling? Basically unless it is icy, just get happed up and out the door, then turn the pedals. It helps that it is so gorgeous round here, wether it be the waves with white horses pounding on the sea in the bays, the farmers going about their business in the fields or the dusting of snow on the hills. We had a gale recently with cold sleet lower down. 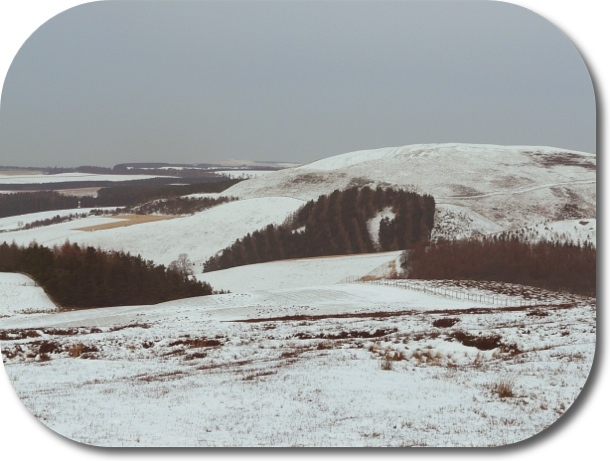 I had previously got out my skis for a failed cross country attempt up in the Lammermuir hills. This time I was lucky. I got up to the start before the reservoir and put on my skis beside the car, then away. Conditions were amazing considering there had been no snow at all two days before. Hardly any wind, deep blue sky and not too cold. I took a fun route up, the wax on my skis just gripping enough to get me up the first slopes. I then came across the wee feeder dam with its water channel leading off. Enough snow to pop along it for a mile or so. As I skied gently along the grouse were calling, making that sound like small motorbikes. I skied round the reservoir then fitted the skins for the steeper ascent to the tops. The snow was slightly crusted but I was soon up above the valleys, only breaking through the crust occasionally. It was glorious up high, calm, views for miles and white all round the horizon. A day to dream about? I only saw two folk out and passed only one, pausing for a wee chat. The descent was ‘interesting’, a few quick turns, but with a mixture of heather end breakable crust it was mainly a stop, a kick turn of my freeheel skis and a scoot off again on a long travers. I somehow managed to ski down, with the occasional slow speed tumble. Just a wee bit along from the car I had to unclip as the patchy snow lower down had decided it was time to melt. Next day, another storm and almost all the snow had disappeared. Sometimes you just have to grasp the opportunity! Up in the Lammermuirs again, 2 days after skiing, where’s the snow? A couple of days later we were up over the hills again, this time on our bikes. It was blowing hard again, but we dug in and ploughed our way up Humbie for coffee and scones. Then with the wind behind us Terry & I peeled off to climb over the Rigg – a locally renowned section. We knew we would see plenty of folk as an audax was on and going that way. After scooting fast along the back roads, pushed by the winds, we came across bunches of cyclists heading upwards. We joined them and pottered slowly up. 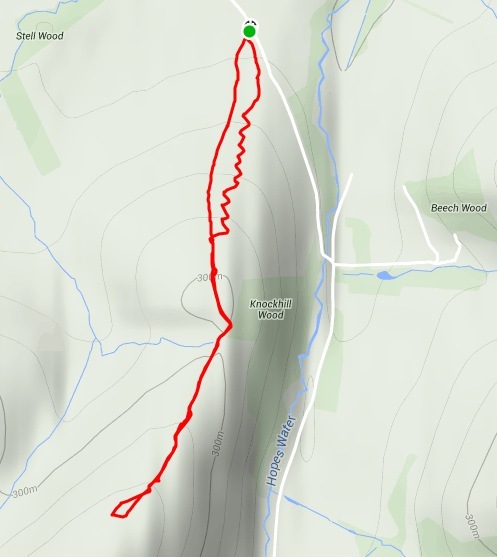 On the steepest section, (17°), I was hit by a ferocious gust and stopped dead with a quick dismount. I was fairly puggled anyway from fighting the wind uphill, so rested for a bit to regain my breath, once there was a slight lessening I mounted again and carried on to the top. The descent was fabulous, whizzing down at 45 mph. On the way we had met other friends so we pottered along, more or less together , chatting away. So a good 65 mile ride, not bad for February? How do I keep warm on these cold days? Plenty of layers. Above 2 or 3°, 3 layers on top, double fleece gloves with oversize cycle gloves on top, buff and head cap too. Breathable waterproof socks over solid soled cycling shoes with no vents and bright pink neoprene overshoes. No real fancy expensive clothing, just stuff that does the job for me. If it gets below -2º another layer on top, winter cycling shoes and a ninja style neoprene face mask and bright yellow, horrible to us mitts. The final tip is to put shoes, socks and gloves on the radiator to warm up well before I go out. Works a treat and makes all the difference to me. I can cycle easily for 4-5 hours if I need to, and my circulation is rubbish! Lastly a treat coming up. I’ve been looking at a newer bike as mine is now 8 years old. The new Specialized Roubaix Expert is looking just the bike for me, so I’ve been enquiring after deals – I’ll let you all now how it goes. This entry was posted in bicycle, Cycling, cyclist, Fossil cyclist, hills, ski and tagged biking, cycling, fossil cyclist, gales, hills, ski, snow, steep on February 27, 2017 by fossilcyclist. ‘The Bad’: When I first started this, it felt so good. It was almost balmy at 6°C after -2°C for a wee while, down to 3 layers and beard not freezing. But it just hasn’t been so fine for the last few weeks and it’s been blowing a hooley for the last few days with storms Gertrude & Henry making themselves known and keeping me off the roads with violent winds. I missed the one quiet day in the middle as I’ve been doing the intros & lighting for our local pantomime, ‘Beauty and the Beast’. De-rigging the lights happened on the same day as the calm so ah well! Freezing weather with dicy roads, ice, snow, gravel, melt water, mud etc. I think you’ll get the idea. New brake blocks first, pedal bearing collapsed, back wheel bearings went, replaced chain but one of the rivets came adrift and the chain plate bent back on itself causing a sudden halt but all is sort of back to peace and serenity again. Colin of Belhaven Bikes was superb, went into the shop to see about getting the wheel bearings replaced and he did it just about on the spot, brilliant service. The rest I did myself. ‘The Good’ is I have very much enjoyed my rides recently despite the conditions plus the snow allowed me to get out on skis locally for a couple of hours up in the hills. Even this wasn’t without a wee bit of grief though. First of all my collapsible poles decided to collapse when they shouldn’t (new ones have now arrived), then one of the skins on the skis used for climbing uphill decided that the glue holding it on to the ski was a bit old and parted ways a few times. More curses of an inventive nature. Just as well no one else was on the hill with me!! Had a good run down, though the snow was very variable with deep banks of soft stuff, delightful nevee and some solid ice to make life interesting! It was gorgeous scooting along on the lower stretch in the sun with fabby views and the coos keeping their distance. Now the ‘Don’t Understand’ part. Americans on guns, I just don’t get it! In Britain we have some of the strictest gun laws in the world. Seems to work on some level as we also have some of the lowest gun crime/ murder rate in the world and the majority of our police are not armed. The majority of murders in the USA according to the FBI are by someone know to the victim. Why does an amendment made in the time of flintlock rifles need to apply to a modern situation? What need does a citizen have of semi automatic or worse weapons? Maybe the right to bear arms should apply only to flintlocks? Though it’s probably way too late for that now. I also don’t understand how the American Rifle Association with only just over 3 million members can seem, from my perspective, to dictate to the whole huge population of the States. Figures from the FBI, looks like you’re more likely to be murdered by family or someone you know. Now I don’t think I want answers to these thoughts, it’s just a highlight of how different two nations can be. Our UK world history has been pretty horrific at times, but I feel we seem to have a better balance these days on the whole. I have travelled in various places around the world and I must admit the country that gave me the most unease was America. Just don’t get me started on Trump though! Enough of philosophising, I maybe should have just kept to the biking? Skis showing the skins attached to the bottom of the skis for climbing up snow slopes plus the ‘freeheel’ bindings. Very marginal snow conditions here though! 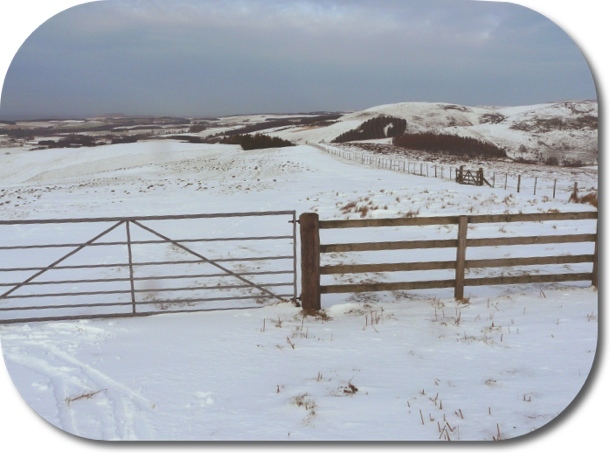 This entry was posted in cycle, Cycling, Fossil cyclist, guns, ice, pantomime, ski, snow, storm and tagged bike, cycling, East Lothian, fossil cyclist, guns, hills, pantomime, Scotland, ski, snow, storm on February 2, 2016 by fossilcyclist. 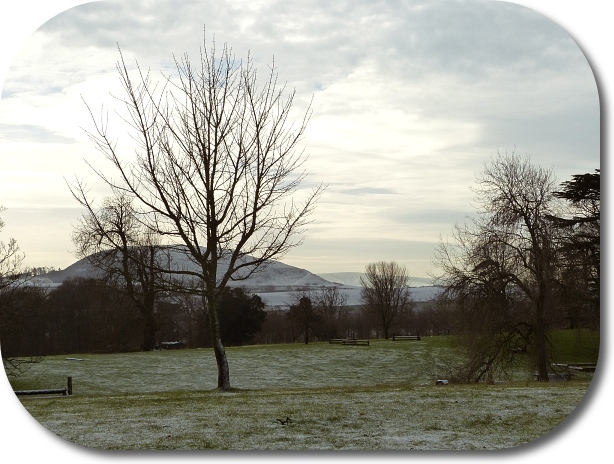 Like a lot of the time recently it’s been hovering around 0ºC, so off for a walk together. I think the road up proved it. Passed the Highland Coos on the way, they didn’t respond much to my cheery hello though. Good coats for this time of year too. After a stroll round the wee partially frozen lake it was off to the delightful cafe for lunch, on the way back I spotted the snow on the nearby hills – so the afternoon was decided on. A wee ski trip beckoned. A bit later on I had skinned up the hills, a bit dubious how the descent would be as the snow cover seemed quite thin. So . . . . . Stopped to take the skins off for the descent and aimed for the whiter bits. 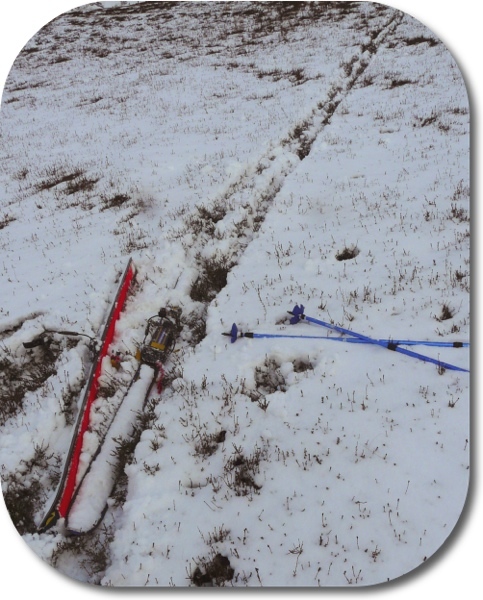 Despite misgivings the ski down proved delightful, with a soft powder on a harder base. It was great for doing my first telemark turns of the season. Not a long ski, but a great way to end the afternoon as it got dark. The next day it was on the bike again, then I planned a rest. However a pal emailed so it was out again on the bike. A beautiful day with views way up to the snowy Southern Cairngorms. Then a day off and a trip to the cinema. 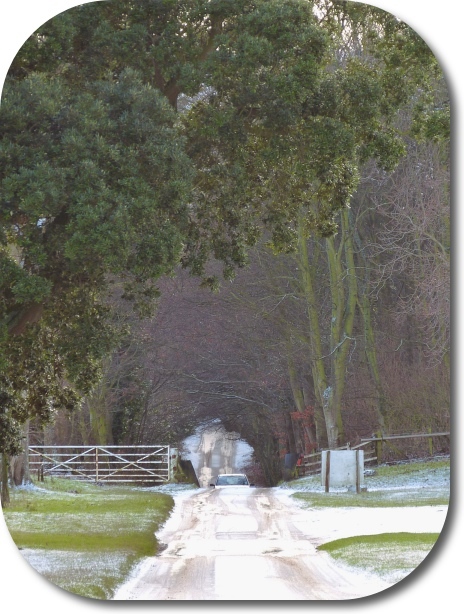 And tomorrow – looks like the snow may be calling again? 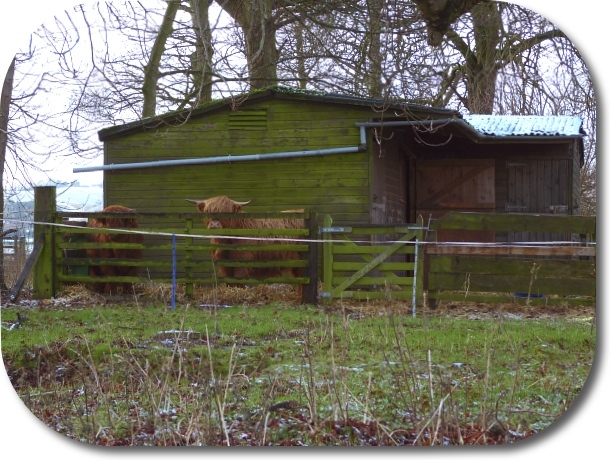 This entry was posted in bicycle, cows, rest, ski, walk and tagged bike, fossil, highland cows, rest, ski, telemark, walk on February 6, 2015 by fossilcyclist.